The remarkable characteristic of Dogecoin’s token price to refuse obeying the general market movement [from the leader Bitcoin – BTC, to all following altcoins] is being highlighted strongly per time of writing. 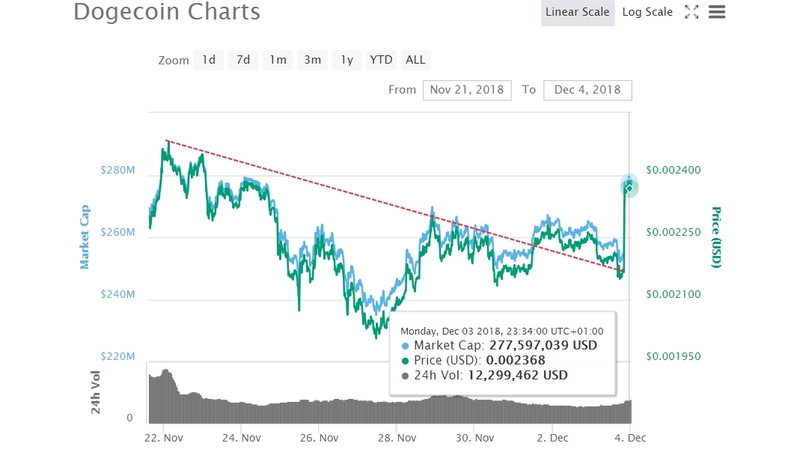 For most of 2018, this trend of making surprising value jumps against the US Dollar and BTC has been present for the memefied coin. Whereas Bitcoin loses value and all top altcoins go down with, Dogecoin simply does its own thing at all times. Very stale coin. Breaking above the weekly declining trend that was concluding with a range bound for three days, has opened gates for the pair DOGE/USD to gain and retest the hurdle at $0.0024 as it is changing hands at $0.002370. Its increasing success throughout the crypto-ecosystem experienced a big hoist when back at the end of August the token transferring bridge between Ethereum and Dogecoin’s chain was announced. While performing as a bridge, it does enable transfers between the two chains easily. The elaborated coin here is in more benefit as its range of operations increases accordingly with the second in lead Ethereum’s flexibility with smart contracts. Dogecoin Founder – Via his official twitter handle, Jackson Palmer posted his ‘simple automatic blocking XRP accounts script’ with which he started a so called XRP Away campaign. The move came as a result of XRP enthusiasts counter-replying and storming him because of his negative comments made recently towards Ripple’s XRP. The latest script before being transformed into an open-source code, was used as a ETH scam bot blocking script. Elon Musk called Mr. Palmer for help to fight the spammers which targeted Musk for months.